NO NEED TO GO FURTHER! YOU ARE ON THE RIGHT PAGE! The Books for Refugees project began as a very small project in early 2016, but it has become more extensive, thanks to the donations from many generous people throughout the world. Your donation goes into a special fund exclusively for the Books for Refugees project. Every dollar of the donations goes to the project. There are no overhead costs. Humanitarian groups throughout the United States and Europe contact me about the projects they are doing that are related to the education of the refugee children. I also reach out to people who are doing projects and who are volunteering in camp schools. 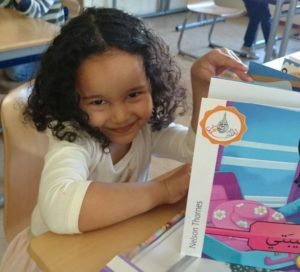 I order high quality Arabic children’s books and have them sent directly to the facilities or to friends who volunteer to deliver the books to the facilities. 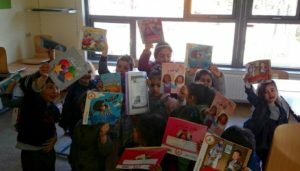 The volunteers send photos of the children with the books. It is an extremely simple process, streamlined to ensure that books get into the hands of refugee children as quickly as possible. Small donations of $5 are welcome and appreciated! Five dollars will purchase a book for a refugee. Parents: Can you imagine not having some books to read to your children? Imagine if your children went to school and there were no books to read? Books are desperately needed and desired by refugee families and volunteer teachers. It ONLY takes a minute. You will feel great knowing you have contributed to a child’s academic and emotional health. Please donate by clicking on the DONATE button above. Thank you for your generosity. Every book makes a difference. One book. One child. One future. Welcome to Sage Literacy Consulting. We are a professional organization under the direction of Dr. Rachel McCormack and supported by committed and enthusiastic literacy professionals. On this site you will learn about the literacy initiatives promoting our belief that everyone should have equal access to literacy. You can click on Literacy Initiatives and Outreach to donate books to refugee children and to read about the work we have done. You will learn about books and resources for babies, children, and teens. Click on Books for Babies, Children, and Teens to see our suggestions. For your convenience, you can buy books right from our site. We are also a premier site for designing professional development specifically suited to your needs. We are happy to customize the types of services you need for yourself, your school, your district, your organization, and your community. Throughout this site we will describe ways to meet your needs regarding high-quality professional development. Click on Professional Development to see what we offer. Sage Literacy Consulting is making the news! Click on our News and Media page. We’ll keep you posted regarding our newsworthy initiatives, innovative ideas, endorsements for great books, and professional development programs. Have fun cruising our site! FEATURED BOOKS: You can click on, view, and purchase some of our featured books here or on the Books for… and Professional Development pages. We have even more suggestions there. Why not CLICK below and get started?